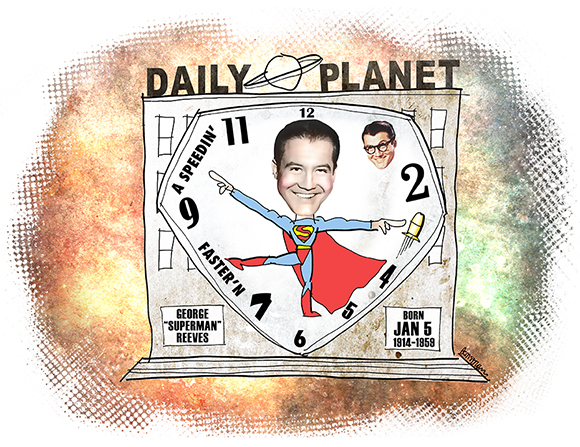 Alas, my first post of 2012, and it’s a day late: a January 5th birthday tribute to George Reeves who played television’s Superman in the 1950s. The show’s opening sequence with its thrilling narration remains one of the most distinctive and best-loved in television history. I’ll be posting other birthday tributes with a clock theme throughout the coming year. It’ll be a great way for me to try out new techniques gleaned from Photoshop tutorials. A clock theme seems ideal for birthdays: it denotes the passage of time and offers some interesting possibilities for image placement. 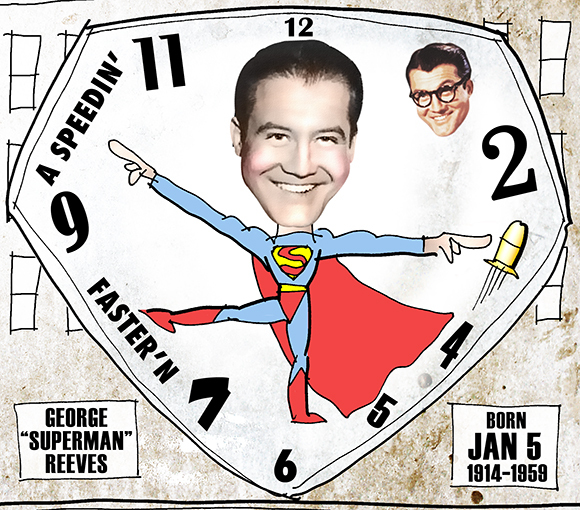 Here’s a larger detail image of the George Reeves tribute. Scroll down to view the original opening sequence of The Adventures Of Superman, circa 1952. What do you think? Have you ever seen the old television series? Do you like the idea of birthday tributes? Hope you’ll leave a comment. ← Year-End Laffs Dept: Gag Cartoons That Won’t Make You Gag– I Hope! LOL…yes, watched that (some in re-runs) when I was a kid. Could do the famous opening lines for you with no prompts and describe each image that flashed across the screen while the words were being spoken. I recall the old and new Lois’s, too. Which leads me to birthday tributes: For me, no. For other people: YES! I liked both Loises (Loises?? ), but particularly enjoyed Phyllis Coates’ harder edge. Her exasperated “Honestly, Clark–!” always made me laugh. Mark, did you know George Reeves appears in the opening scene of 1939’s “Gone with the Wind”? Hi, David. I did know that incredible but true fact for a funny reason: Years ago, I went to see Gone at a revival theater– I’d never seen the movie before. When that scene came on, several people in the audience cried, “Look, it’s Superman! !” I was so startled, I almost blurted out the same thing myself!